Although it did not come from Christ in the form it has today, it is clear from Scripture that reconciliation was central to the ministry of Christ. In The Sacrament of Reconciliation David Coffey examines the theology of reconciliation and addresses the crisis that the sacrament faces in the present pastoral situation of the Church. Father Coffey calls on Scripture and tradition, to the magisterium, and to theology in his analysis. However, he also moves beyond these to look at the practice of the Church and to the liturgy as it is regulated, celebrated, and experienced. 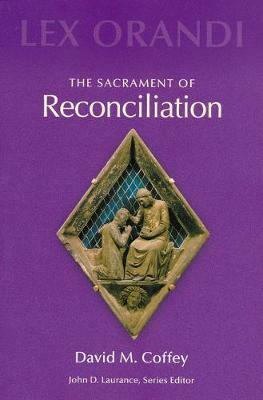 In doing so, he presents a theology of the sacrament of reconciliation that is truly based on, and inspired by, the liturgy. This theology is molded by two contextual factors: the crisis that the sacrament is currently undergoing in the developed nations of the West and the restrictions imposed by Rome on the third rite," the most communal of the three forms of the sacrament. Since the sacrament of reconciliation exists for the forgiveness of postbaptismal sin, chapter one is devoted to a theology of sin. Here, Father Coffey identifies what the main theological cause is at the heart of the present crisis, namely, a serious and widespread confusion about the nature of sin. Chapter two focuses on the Church's ministry of reconciliation. This chapter provides both essential knowledge and a response to the widely held view that one does not need to turn to the Church in order to obtain forgiveness from God for sin. Chapter three examines the four parts of the sacrament: contrition, confession, absolution, and the prescribed work of penance. The investigation in this chapter suggests theological limits to possible future reforms of the sacrament. In chapter four Father Coffey offers a detailed examination of the three sacramental rites and the no sacramental service set down by The Rite of Penance. Finally, in chapter five, Father Coffey offers some predictions about the future of the sacrament, based on his study. David M. Coffey is a priest of the Archdiocese of Sydney, Australia. He holds the William J. Kelly, S.J., Chair of Catholic Theology at Marquette University. He has published numerous articles in theological journals and several books.